EAB has NOT been detected in North Dakota. Unfortunately, it is believed that EAB may reach the state in the coming years. EAB adult females lay their eggs on the bark of the tree. Eggs are very small (less than 1mm) and rarely observed. Once hatched, the larvae tunnel their way into the tree where they feed beneath the bark creating serpentine galleries. 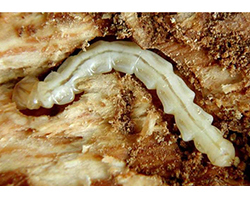 Larvae are up to 1.25 inches long, creamy white and have several bell shaped segments. In the spring the EAB will pupate beneath the bark and emerge as an adult. 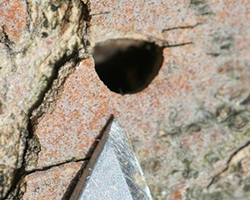 The adult EAB will chew its way out of the tree creating D-shaped exit holes that are approximately 3-4mm in diameter. 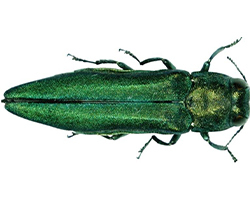 Adult EAB are 0.3-0.53 inches long with metallic green elytra (wing coverings). While feeding beneath the bark of the tree the larvae disrupt the flow of nutrients throughout the tree. Once infested an ash tree can die in as little as 2 years. There are insecticide treatments available however they are costly, treat individual trees and most need to be repeated every year. Insecticide treatment is not recommended until EAB infestations are within 15 miles of your location (NDDA, NDFS, NDSU Extension position statement on insecticide use). The closest EAB has been found to North Dakota is Winnipeg, Manitoba, Canada, just 50 miles north of our border. In the U.S., the closest infestation is Duluth, MN as well as the greater Minneapolis/St. Paul metro area. Two counties in Nebraska have also been placed under quarantine in 2016. USDA APHIS PPQ contracts the placement of EAB traps all across the state each year to monitor for this pest. 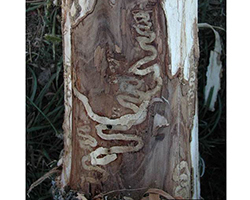 For more information on EAB biology and management check out the NDSU Extension Publication “Emerald Ash Borer Biology and Integrated Pest Management in North Dakota”. contact the North Dakota Department of Agriculture at 701-220-0485 or 701-328-4765. • Don't transport firewood into North Dakota and encourage your friends and relatives to refrain from bringing firewood into the state.